Today, when you order "No Fail Kid's Magic Vol. 1 by Sean Taylor", you'll instantly be emailed a Penguin Magic gift certificate. You can spend it on anything you like at Penguin, just like cash. Just complete your order as normal, and within seconds you'll get an email with your gift certificate. 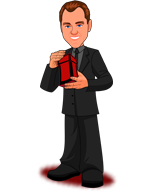 Sean Taylor is best known as a mentalist but for many years, early in his career, he made a full time living from entertaining children. Sean is a dynamic, quick witted, funny and talented family entertainer. Consequently, he could be found each week working solidly for audiences from the smallest, back yard birthday party up to huge corporate stage shows for all ages. Working in and around small towns, he was forced to constantly develop new material in order to remain current and manage repeat bookings. The DVDs in this series contain over 30 different tricks, routines and effects. 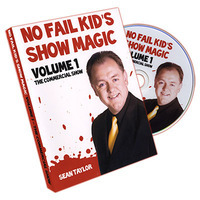 You will see them performed live for an audience of excitable and ebullient kids and then, aside from explaining the effects, Sean also details the secrets behind the tricks. He covers in depth the kinds of things you should consider when entertaining kids with tips, gags, lines, bits of business and advice gleaned from years of live performance. In this show, Sean performs a group of tricks which formed the backbone of his working act for more than 15 years. The show packs small but is big enough to play for the largest of crowds. How to structure a kid's show. Excellent advice here in this DVD. Sean gives real world advice to anyone keen to get into kids magic. and its great to see a performance from start to finish, in the trenches. I know sean, and he's great to get advice off and always willing to help. highly recommended.